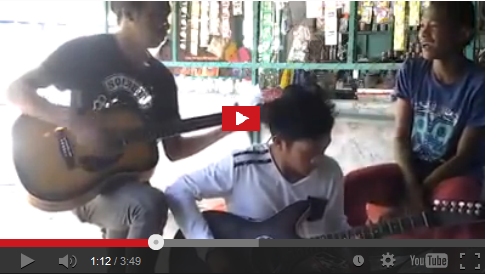 15-Year-Old Boy From North Cotabato Sings An Air Supply Song. Nails It! If someone makes the claim that the Philippines is an archipelago teeming with talented singers, it would be very difficult to dispute such a claim. After all, this country has proven time and time again that indeed it breeds really talented musicians. And they come from all walks of life and backgrounds. Products perhaps of the Filipino's penchant for music and celebration. Just recently, a four-minute video of a 15-year-old boy in North Cotabato belting out an Air Supply tune (Having You Near Me) went viral on Facebook and YouTube. The boy in question is Jhong Madaliday, a young lanky fellow with an infectious smile and a powerful voice. Zacky Kandalayang, the man who captured the moment and shared it on Facebook, said he was awakened one day by the sound of guitars and singing from outside his window. Peering outside, he saw three boys with two guitars having fun. Enchanted by their music, Kandalayang took a video of the trio and posted it on Facebook. The rest, they say, is viral history. Having You Near me is a track from Air Supply's 1980 album Lost in Love. Other popular songs from the Australian duo are Even the Nights Are Better, The One That You Love, Every Woman in the World, Making Love Out of Nothing at All, Here I Am, and All Out of Love. And here's the original by Air Supply. The similarities in the voices are definitely there. You can even argue that Madaliday's cover trumps the original.